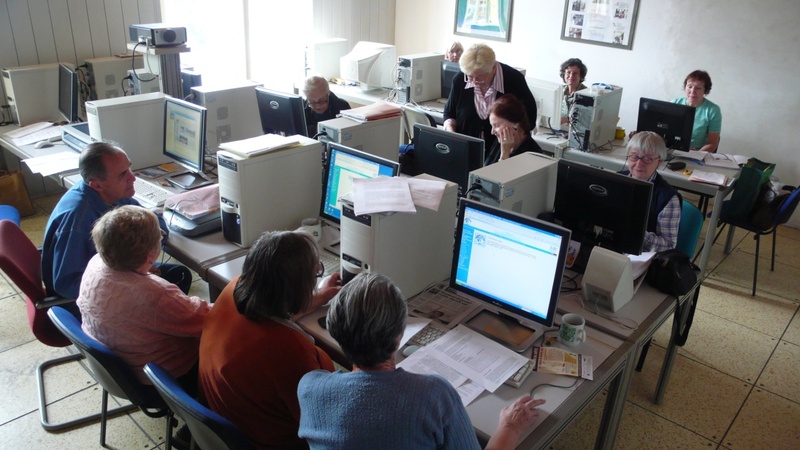 The first course for seniors within the framework of U3V at the department was called "Working with Computers" and was opened in the school-year 1998/99. The course enrollment was 35 participants (25 women, 10 men), the average age was 66 years (the oldest participant was 87). Starting from 1998, the course has been opened every year with quickly growing demand. In the school year 2001/2002, the total enrollment is 100 participants split into 5 teaching groups, which basically saturates the free time of both the teaching staff and the laboratories. The results of participants of these courses for seniors were presented at international conferences and have obtained a very good response. In frame of course we collaborate with similar activities abroad (for example in USA, Germany, Spain and Great Britain). In 2001 we start to realize with seniors two main projects: SEN - Seniors Portal and publication History of computers in Czech Republic. The web pages of University of the Third Age. is addressed exclusively to seniors who want to learn how to use computers. The course duration is two semesters. A registration fee is paid at the beginning of each semester. The course lecturers are members of the department assisted by students and seniors. Teaching in computer labs is organized in one 90 minutes session per week during the semester. Sessions are not organized during the exam period but the course participants are allowed to use the lab. Upon finishing the course, each participant obtains a certificate.